InPhase Technologies announced today that it has demonstrated the highest data density of any commercial technology by recording 515 gigabits of data per square inch. Holographic storage is a revolutionary departure from all existing recording methods because it takes advantage of volumetric efficiencies rather than only recording on the surface of the material. 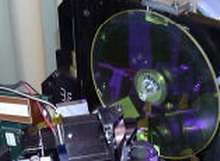 To compare, magnetic disk drives allow 300 gigabits per square inch data density. In this demonstration there were over 1.3 million bits per data page, and 320 data pages spaced 0.067 degrees apart were stored in the same volume of material. A collection of data pages is referred to as a book, and InPhase’s PolyTopic recording architecture enables more holograms to be stored in the same volume of material by overlapping not only pages, but also books. Three tracks of overlapping books were written with a track pitch of 700 microns. The InPhase TapestryTM material was 1.5 millimeters thick, and the laser wavelength was 407 nanometers. InPhase will be presenting several holographic storage papers at the Optical Data Storage Conference from April 23-26, 2006 in Montreal, Canada.